This is a prophecy that has been accomplished like many others. 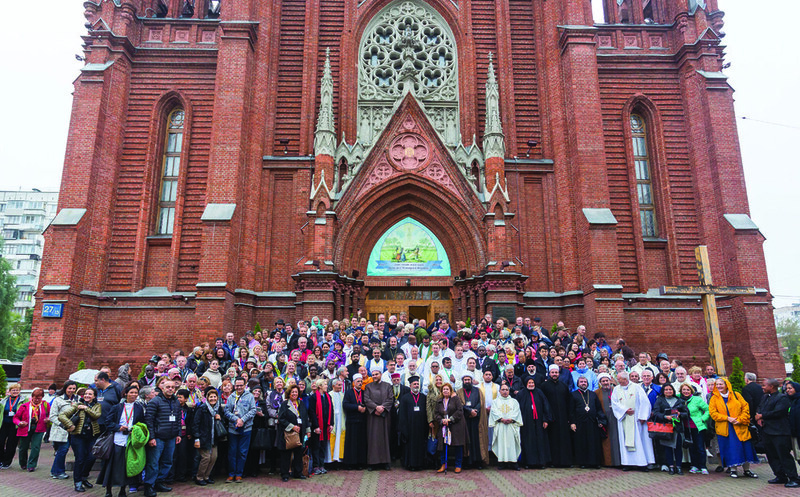 The pilgrims from 63 different countries and 16 different Christian denominations started to arrive in Moscow on that day. Those who had not seen one another for a long time or who only knew each other from email or social media had the opportunity to meet, chat, and get ready for the program the next day. Some of our guests were not able to attend our pilgrimage because they did not get their visas, or had to undergo last minute health issues, but they nevertheless sent us their speeches. After breakfast, we all moved to the conference hall for the opening of the pilgrimage. The ceremony started with the Russian National Hymn. Then, as it is the best way possible, we started our pilgrimage with the Lord's Prayer in Aramaic. Right after the prayer, we had the procession of the clergymen from four different religions (Christianity, Islam, Judaism and Buddhism), totaling 21 different Christian and non-Christian denominations. At the end of the procession, Vassula welcomed everyone with words that outlined the core message behind the pilgrimage: Peace, El Salaam aleikoum, Shalom. 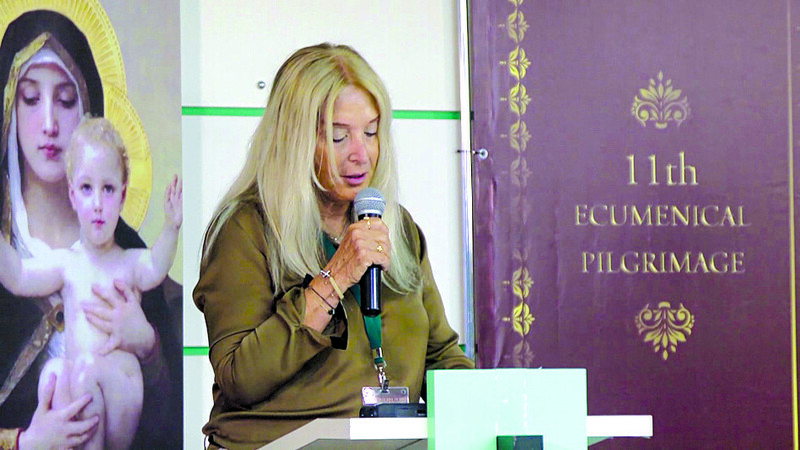 She spoke of the value of interreligious dialogue and insisted that we must be the leaven to go and promote this culture of dialogue in our own countries reminding us that: "Anyone who claims to be in the light but hates his brother is still in the dark." 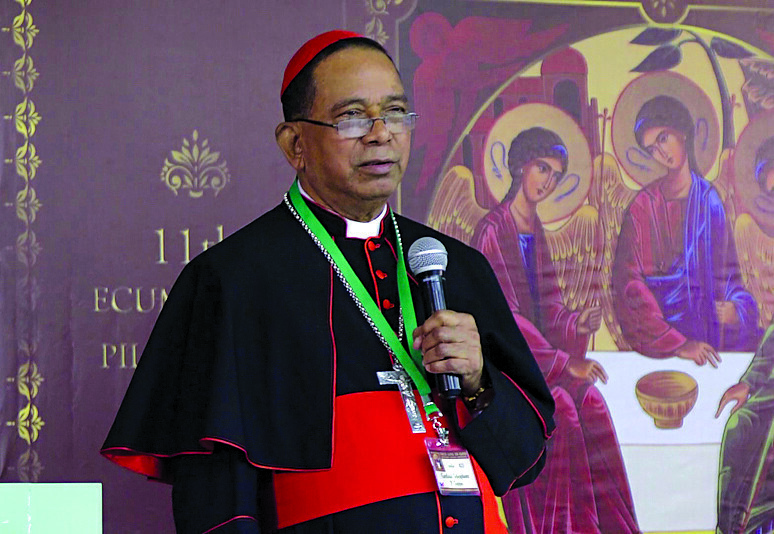 (1 Jn 9) Also, Telesphore P. Cardinal Toppo said a spontaneous word of welcome calling everyone pilgrims of peace. Then we had the Greek Orthodox Liturgy. 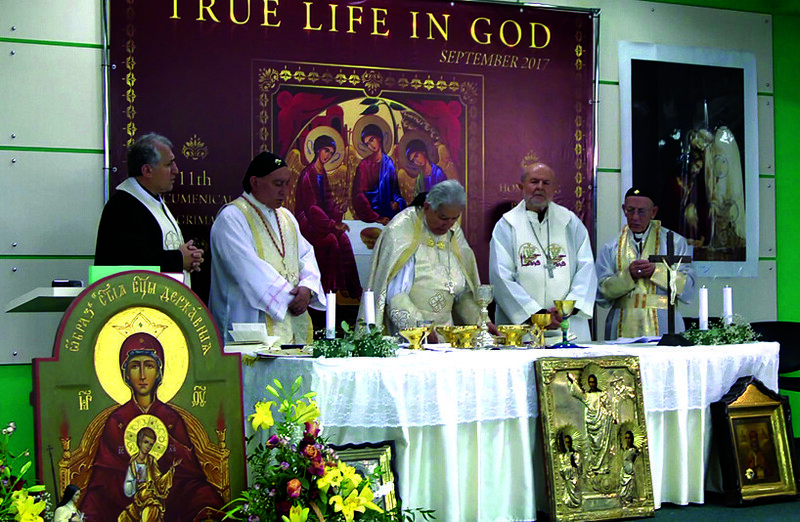 The Liturgy was concelebrated by Orthodox clergymen from the United States, Greece, Romania and Lebanon. Archimandrite Nicolas said: "When in Russia do as the Russians do," so he asked everyone to cross themselves in the Orthodox way using the three fingers and to cross themselves from right to left. We could see many Catholics trying to cross themselves in that way as a gesture of love to their Orthodox brothers and sisters. In the afternoon the pilgrims could visit the Izmailovo market, situated at a walking distance from the hotel. It is a colorful market, a very typical decor of the Russian culture. Many pilgrims had the chance to shop there. Inside the market there is a church, and we discovered that many marriages are performed there due to the fact that the place itself is very beautiful. Later in the day we started our rotational trips to four different monasteries. 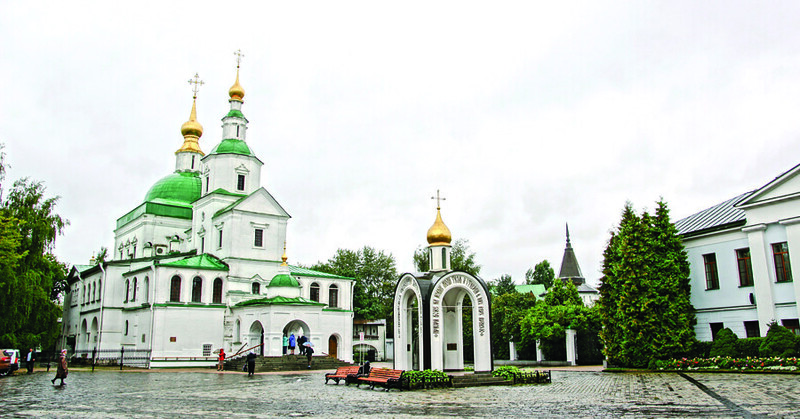 Our bus took us the first day, with Vassula, to the Donskoy Monastery. 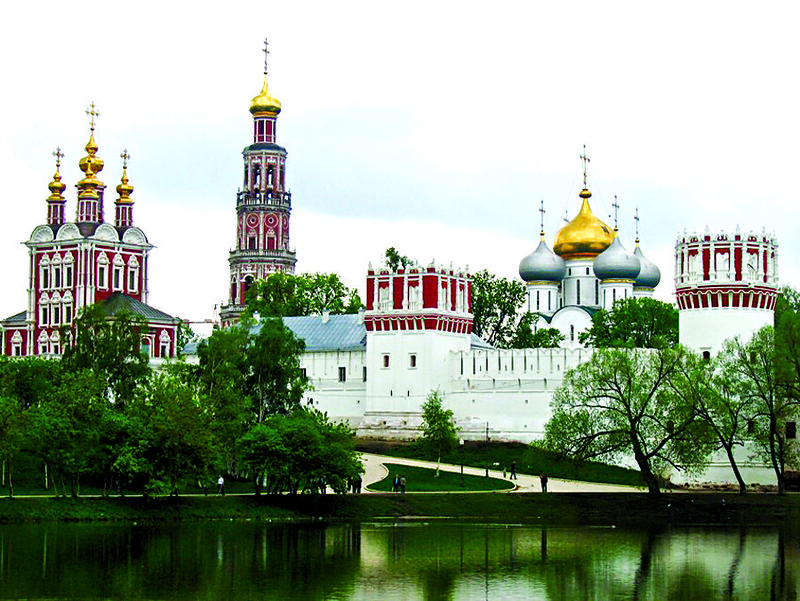 This beautiful Monastery was founded in order to defend the Moscow Kremlin from southern invasions. 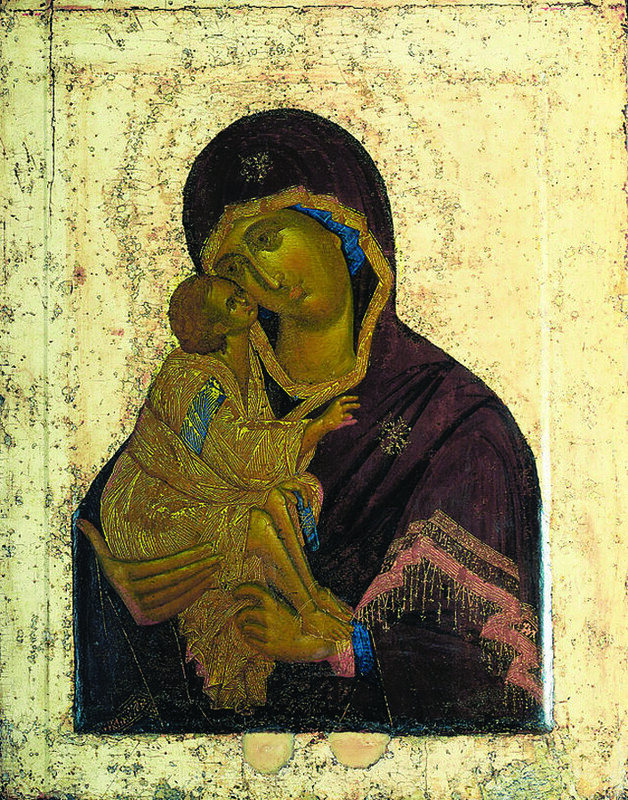 The beautiful Icon of our Lady of the Don depicts Jesus with both legs on Mary's arm. A reputable part of this monastery is a cemetery, where many elite people, including the famous writer Aleksandr Slozhenitsyn, are buried. During our visit we had the chance to pray for a while with the monks at Vespers. Some of the sculptures in the garden are the valuable remains from the originals found in the Cathedral of Christ the Saviour after it was demolished by the Soviets. The third day marked five speeches presented in the morning from leaders of various religions. First, we saw a video from Dr. 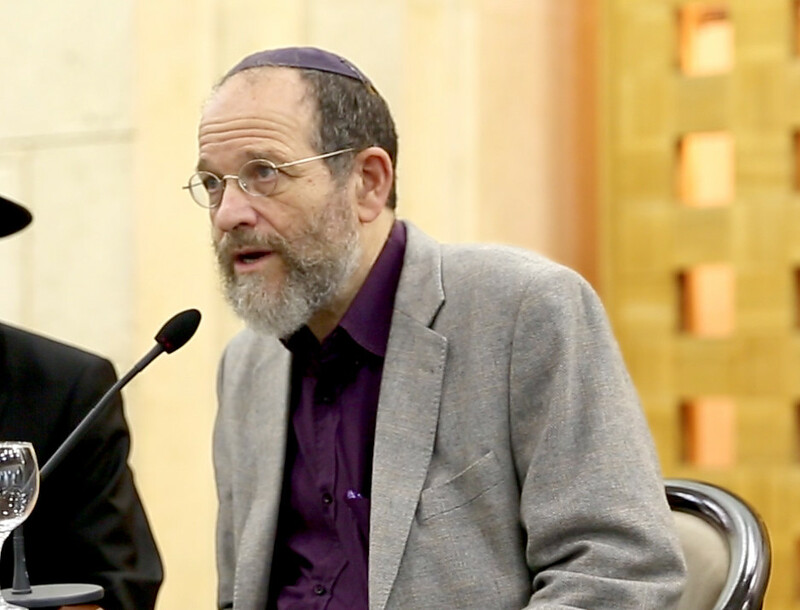 Rabbi Alon Goshen-Gottstein Founder and Director of the Elijah Interfaith Institute. In the video the heads of various religions and denominations spoke about the importance of friendships between people of different creeds. Rabbi Alon then spoke about this question of friendships across religions. He told a story about a noted rabbi who once was asked to teach the entire Torah to someone who was standing on one leg. He summed it up as follows: “Do not do to others what you would not want done to yourself. That’s the whole Torah, the rest is explication.” That Golden Rule is present in all world religions. In addition he called for leaders to focus more on the highest teachings of religion, touching on the importance of compassion and hospitality as a foundation for extending friendship to others. and I shall do the rest." So to allow this miracle to happen, we need to first die to ourselves, repent and work with sincerity. 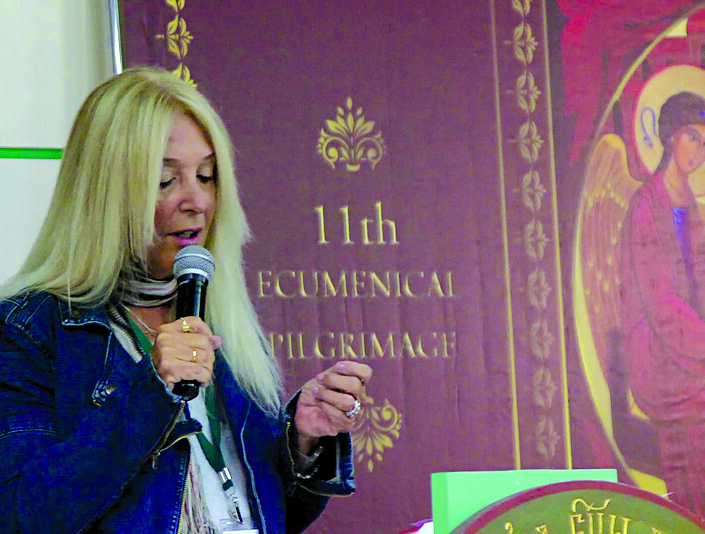 She highlighted how in the TLIG pilgrimages Christians coming from various denominations start to feel One again. So everything is possible for God, but first He needs to hear our cry of repentance. She read a verse from the Holy Koran on prayer and charity and ended by saying that the bridge that unites us is there, right in front of us, but in our darkness we fail to see it. 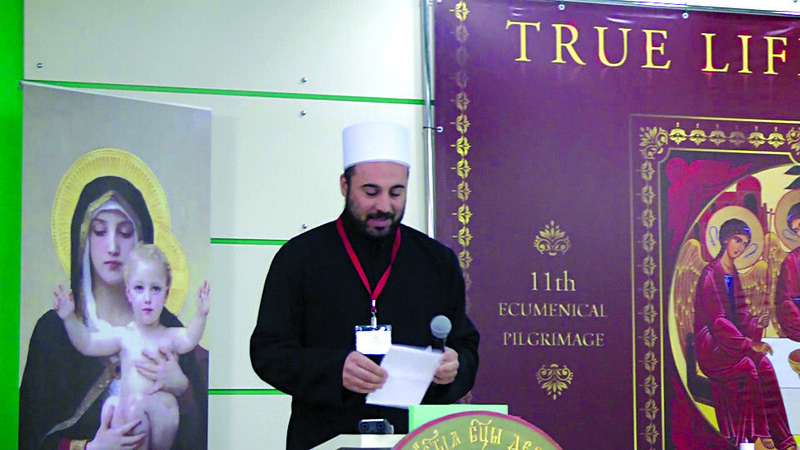 Then, Sheikh Muhammad Ben Mustafa Valsan, Director of the magazine “Sacred Science” from France witnessed about the beautiful relationship between his Sufi community and the Cistercian monks who live nearby. He said the monks have protected his community from the locals who were afraid of them. Friendship between them has resulted in common silent prayer, "the prayer of the heart" and a common invocation chosen from a prayer by Gregory of Nazianz addressed to the One and Supreme God: O Thou Who art beyond all, what else may we rightly call Thee?... All things, both the speaking and the speechless, proclaim Thee... To Thee is the prayer of all... O Most-Named, how then shall I address Thee? Sheikh Valsan ended by reminding us that people working for peace must be predominantly animated by right intention and goodwill, having in view the interest of God in their work. 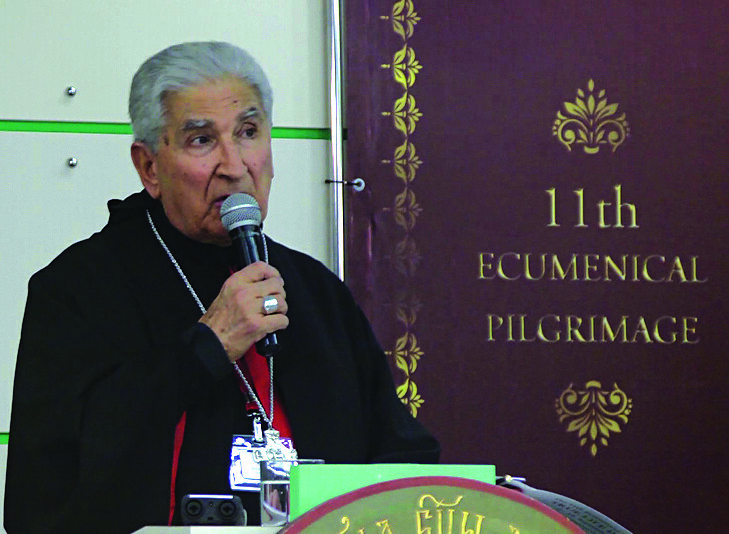 Bishop Isidore Battikha, Archbishop emeritus of Homs, Syria Bishop of Puerto La Cruz, Venezuela, from the Greek-Melkite Catholic Church spoke next. He told us a story about two brothers who were divided and wanted to build a wooden wall between them. The carpenter whom one of them had hired for the job, ended-up building a bridge over the river that separated them. That bridge connected the two brothers and reconciled them. We are called to be builders of bridges. Bishop Battikha wished the Muslims present with us a Happy Feast Al Adha, which they were celebrating during the time of the pilgrimage. He told us that his mother used to kiss the hand of a Jewish man in her town in Syria; finally, he became upset about it and asked her why she did this. She answered: "He is a holy Jew." In extension of this example, the Bishop called everyone to be a good Christian, a good Muslim and a good Jew. He also said: "If the religion you follow does not allow you to love others, leave it!" 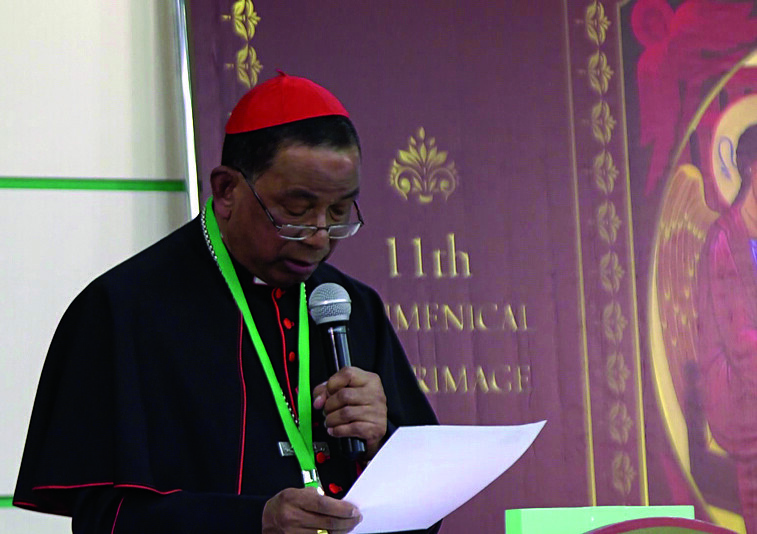 The last speech that morning was given by His Grace Archbishop Martin S. Jumoad Archbishop of Ozamis, Philippines. He ended his speech by saying that in order to change the world one must start by changing oneself. It must start within the self. 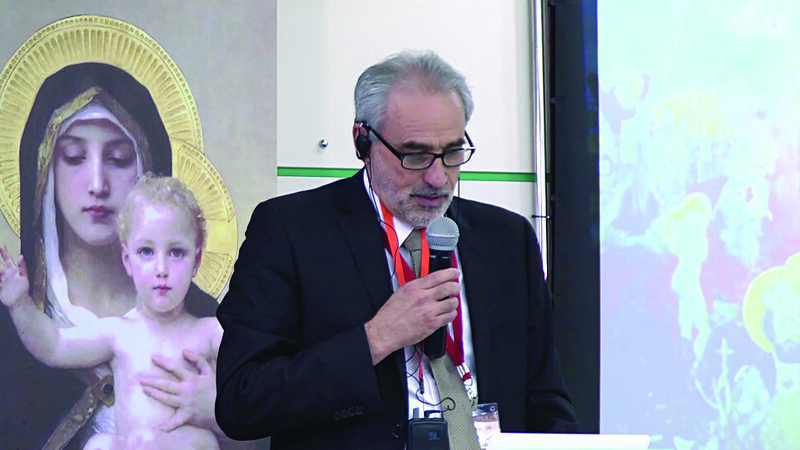 It is noteworthy to mention that for the first time nine TLIG translators were present at the pilgrimage; they are TLIG readers who volunteered to provide simultaneous translation of the speeches and the events. The translation team was prepared beforehand. Pilgrims from all languages and backgrounds were then able to understand the respective message and enjoy the pilgrimage. The Arab delegation was very thankful and highly appreciated that gesture. After the speeches our rotational trips travelled to four different monasteries. Our bus took us this day to Danilov Monastery. This monastery is the official residence of the Patriarch of Moscow and all Russia. Inside the monastery is situated the Cathedral of the Holy Fathers of the Seven Ecumenical Councils. During the communist era, the bells of the monastery were saved from being melted by an American industrialist who purchased them and donated them to Harvard University. In 2008, the bells were returned to the Russian Orthodox Church. 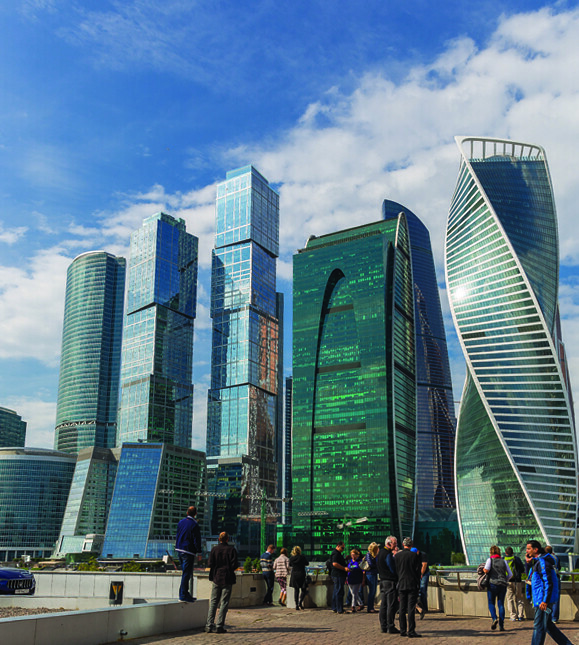 After that visit, all the pilgrims were taken to Moscow City, the business heart of Moscow with modern high-rise towers. From there we took a boat cruise on the Moscow River. We also dined on the boats. While on the boats, pilgrims had the chance to mingle; some of them approached the Muslim Sheikhs and asked questions or took pictures. This open-hearted encounter was actually ongoing throughout the pilgrimage. In the evening we celebrated the Divine Liturgy according to the Coptic Tradition. After dinner the priests provided Eucharistic Adoration and confessions. We departed early morning to see the Trinity Lavra of St. Sergius outside Moscow. 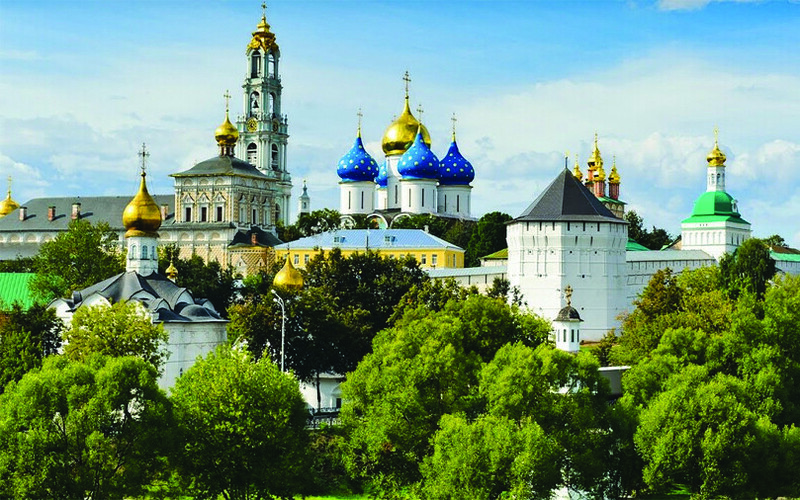 This breathtaking monastery was established by St. Sergius of Radonezh and it is considered one of the three most important monasteries in Russian Orthodoxy. There are several beautiful churches inside the walls of the monastery. Inside the Cathedral of the Holy Trinity, the pilgrims were able to visit and be blessed by the relics of St. Sergius; the sound of constant prayer was heard and recited near his relics. Outside, in the main square, we drank the holy water that cured a highly-ranked Japanese politician, even though he was not Christian. When we returned to Moscow we visited the Cathedral of Christ the Saviour. When this cathedral was being built in the 19th century, a nun predicted that the place was cursed, and that instead of a church a pond of water will reside here. Her prophecy came true when the Soviet Regime blew-up the cathedral and built a swimming pool in its place. This cathedral is one of most majestic structures in Moscow. 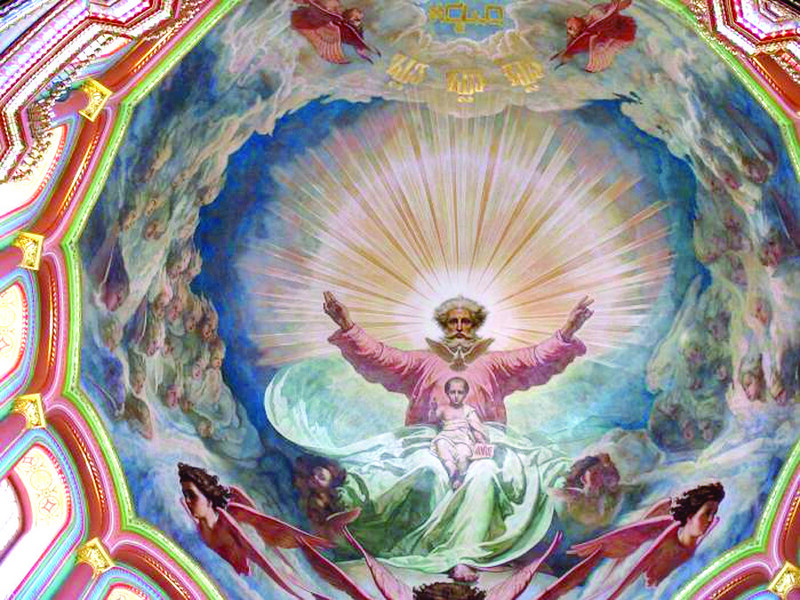 The Trinity is depicted on the central dome. Inside there are only three seats, one for the Patriarch and two for the Tzar and the Tzarine. The icons inside the restored cathedral were completed in one year. The relics of many saints are placed on the altar’s left side. 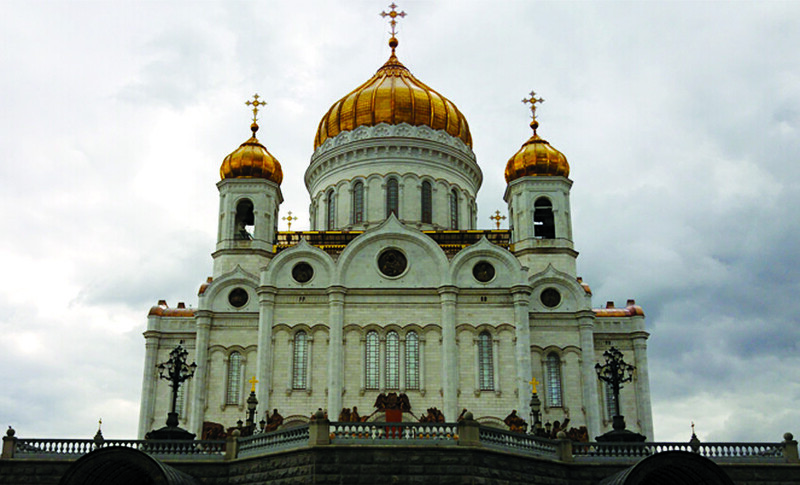 Overall, the TLIG pilgrims were mesmerized by the beauty of this cathedral which is not far from the Moscow Kremlin. It is a must-see. In the evening, four speakers delivered their speeches on peace and the bridging our divisions. 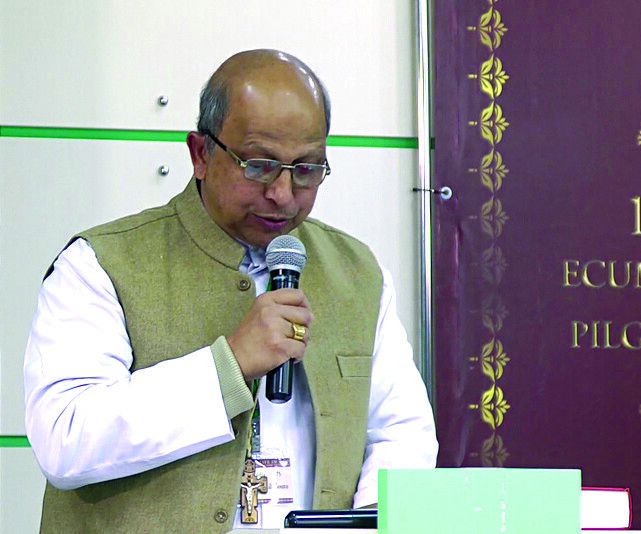 His Grace, Archbishop Anil Couto from the Roman Catholic Archdiocese of Delhi was the first speaker. What he mentioned is quoted as follows: "It is a travesty of religion when religion becomes a tool to spread hatred and violence in society and worse still when it is politicized to gain votes and win elections in the name of religion. . . . It is only when we recognize the God-given human dignity and equality of one and all and accept each other as brother or sister, then and then only will the reign of justice become universal. Justice grows out of love and without love justice cannot subsist. This is possible because love is a decision, an act of the will- that mighty power within us, which in partnership with the Lord, can bring about change." Quoting from Archbishop Angelo Fernandes' book, Vatican Two Revisited, he said, "Peace never means just the absence of trouble; rather it means total well-being, everything that makes for a person’s highest good. This peace has always got to do with personal relationships: a person’s relationship to self, fellow human beings and to the Lord of all. . . . Only when people can live in peace with their Maker can a durable peace exist in human relations." The Archbishop also touched on the issues of the economy and poverty in the world. 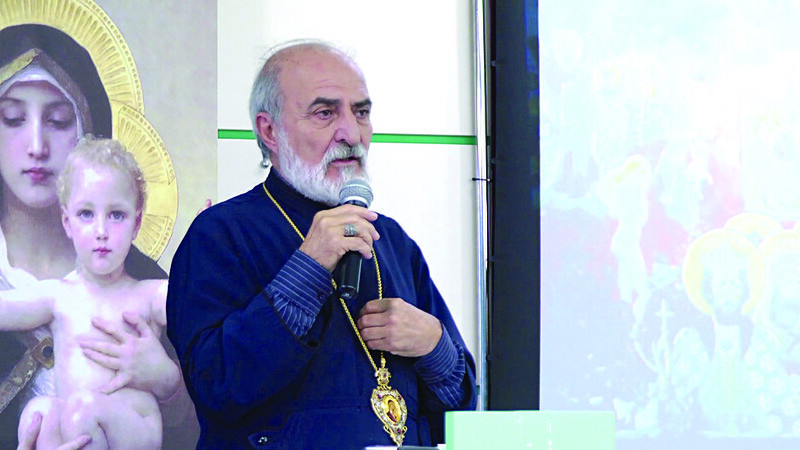 Subsequently, His Grace Archbishop Antoine Chahda, Syriac Catholic Bishop of Aleppo, Syria spoke about the coexistence in Aleppo between Christians and Muslims. 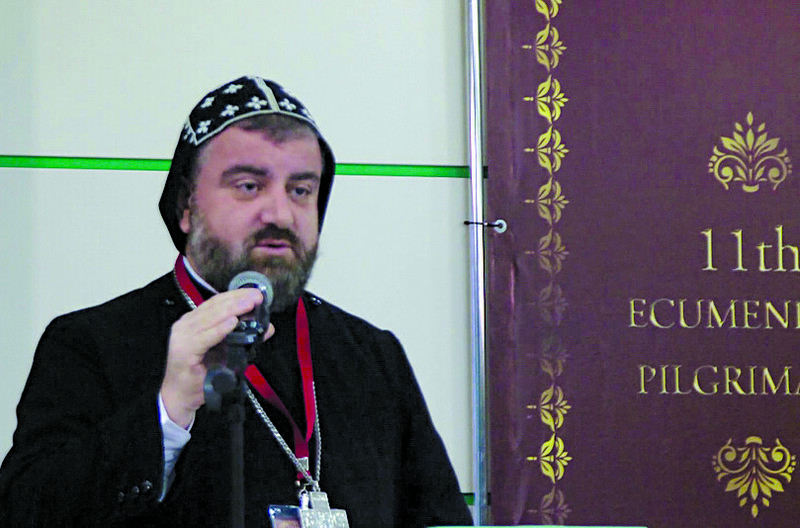 He said that: "Aleppo, in the context of Christian religion, is an ecumenical city par excellence. It has six Catholic and three Orthodox denominations and two evangelical communities. They live together in mutual respect; engage in periodic and monthly meetings, working together for the benefit of Christians regardless of their denomination. The same with Muslims from the different rites, for the work is to agree on what unites both religions not on what separates them. Christian clergy meet Muslim religious scholars never to discuss matters of religion, or to convince one another of their religion, but to work on mutual love and living together in peace, and staying away from all that incites tension or fanaticism, or all that leads to categorizing the followers of other faiths as infidels." 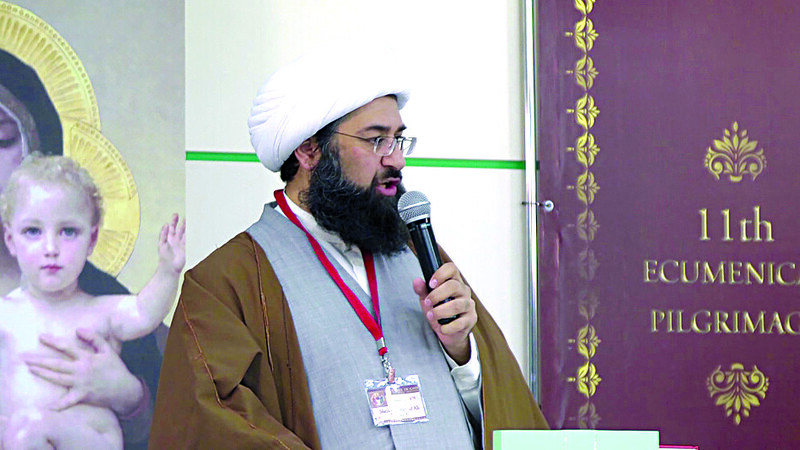 The second Muslim speaker was Sheikh Mohammad Ali El-Hajj Ali Al-Amili, from the Shiite denomination. He is the director of the Seminary of Imam As-Sajjad, Beirut. Sheikh Mohammad spoke about a "Spring of Faith." He said that faith is the common space between all believers of the Almighty God, contrary to the religious frames that differ in form between one religion and another, even between one denomination and another. According to him: "If we manage to move our focus from the manifestations of the religion to the essence of faith, then the space of what is in common between the followers of the religions will be widened to its maximum." Interestingly, he said that "Diversity" is God's norm in His creation. It is the source of the true value of humans, for creating repeated and similar copies of a human being doesn’t make sense. Accordingly, we can bridge our divisions through brotherhood, through the fact that we are all the successors of God on earth, through our common belief in the Almighty God and finally through the fact that we all share the same fate (death). He ended by saying that "our meeting is a responsibility." Fr. 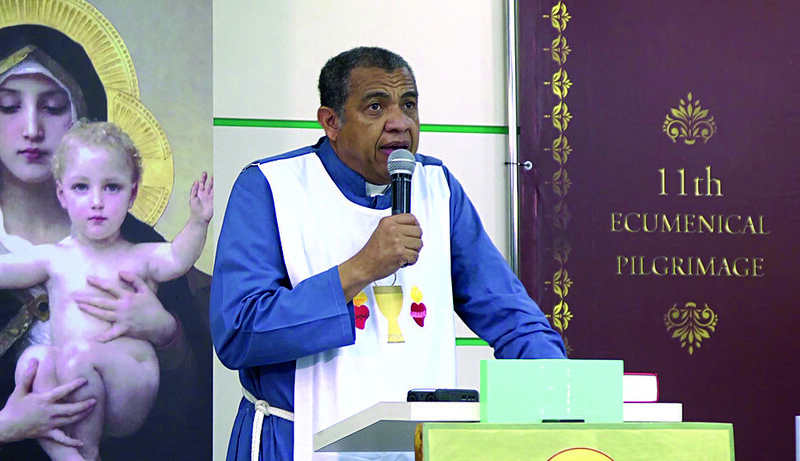 Teófilo Rodríguez is a Roman Catholic priest in Panama and Founder and Director of the Fraternity of the Sacred Hearts of Jesus and Mary’s Divine Mercy. God wants to make his home in you, in me, in us. The Holy Spirit will teach and remind Christ’s promises. True peace will only come from Christ. The prince of this world has no hold on Jesus Christ. In his speech he reminded us of Pope Francis’ words from October 2, 2016, spoken at an inter-religious meeting in Azerbaijan: “Religions, on the contrary, which help to discern the good and put it into practice through deeds, prayer and diligent cultivation of the inner life, are called to build a culture of encounter and peace, based on patience, understanding, and humble, tangible steps. This is the way a humane society is best served. For its part, society must always overcome the temptation to take advantage of religious factors: religions must never be instrumentalised, nor can they ever lend support to, or approve of, conflicts and disagreements." Later that night we celebrated an Ethiopian Divine Liturgy that began with an Indian Evangelical Dance performed by an Indian priest who evangelizes through that type of dancing. After dinner, the priests provided Eucharistic Adoration and confessions. Right after breakfast, we all went to the Roman Catholic Cathedral of the Immaculate Conception in Moscow to celebrate Mass. 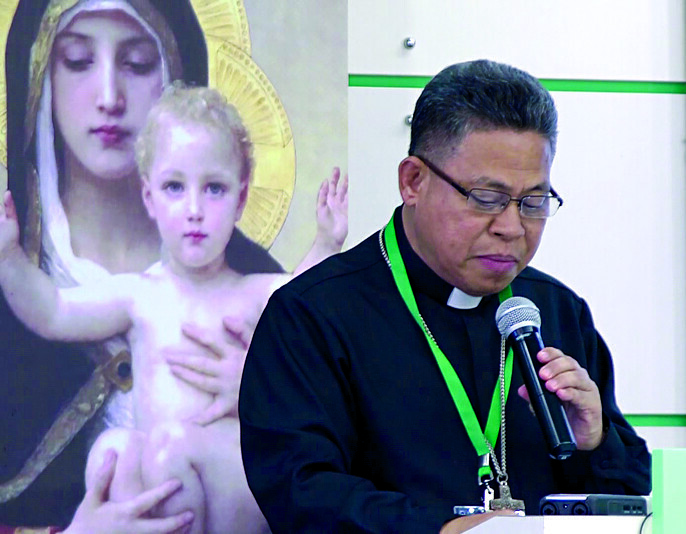 We were warmly welcomed by Fr. Vladimir Kabak SDB, the priest responsible for the cathedral, who welcomed us in the name of H.E. Msgr. Paolo Pezzi, Archbishop of the Archdiocese of the Mother of God of Moscow. Cardinal Toppo was the main celebrant. At the end, all the clergy along with the religious leaders of the other religions gathered in front of the altar for the memorial picture. They did the same on the stairs outside the cathedral with many pilgrims who surrounded them. It was divine. At the time of our departure, all the buses headed towards the Kremlin and Red Square. The cardinals, archbishops, bishops, sheikhs and the rabbi took a separate bus because afterwards they visited the Kremlin to attend a meeting at the Russian Patriarchate in the Department for External Church Relations. TLIG had received a meeting invitation letter signed by Bishop Hilarion Alfeyev, a bishop of the Russian Orthodox Church. At present he is the Metropolitan of Volokolamsk, the chairman of the Department of External Church Relations and a permanent member of the Holy Synod of the Patriarchate of Moscow. While the VIPs were meeting at the Patriarchate, the pilgrims were enjoying Red Square, St. 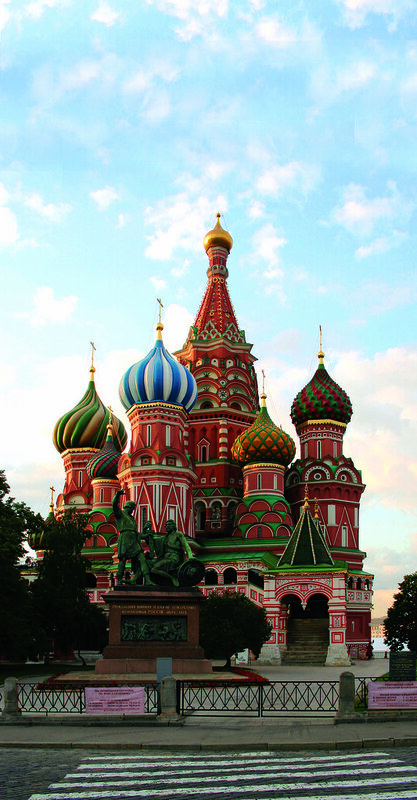 Basil's magnificent Cathedral and Moscow's elite mall: the GUM. After visiting Red Square, we had lunch in downtown Moscow and then headed towards the last of the four monasteries: the Novodevichy Convent for nuns. If you are a female looking for a husband, you can come to this convent and touch the Naprudnaya Tower! Yes, this is what Russian girls do, according to our guide. The icon-style inside this convent is a blend of the Orthodox and the Italian traditions. Interestingly, we saw on the roof of the main church the painting of the Coronation of Mary, very famous in Roman Catholic churches. 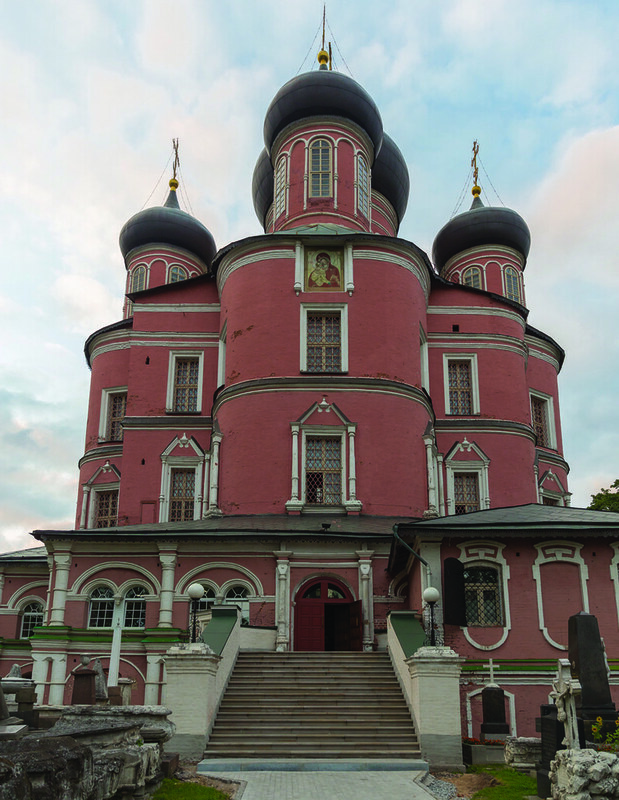 This convent is famous because it has housed ladies from many Russian royal families. In the evening we listened to three speakers. The Right Reverend Bishop Riah Abo El - Assal, Thirteenth Anglican Bishop of Jerusalem and the Middle East shared with us a story about a meeting with the former Prime Minister of the United Kingdom, Mr. Tony Blair. He was one of four bishops trying to divert Mr. Blair's attention from war to peaceful means. Blair's explanation was: "We go to war against Iraq in order to pave the way for peace in the Middle East." To which Bishop Riah responded: "Mr. Prime Minister: The shortest route to Baghdad goes through Jerusalem. Once peace comes to Jerusalem, peace will come to the whole world." He added: "Wars never bring genuine peace. Genuine peace is not the absence of war, neither the cessation of hostilities, and certainly not the quiet which comes out of subjugation and oppression… What is really this ministry we have been given as believers in God? It is the work of breaking down walls of mistrust and hostility wherever they exist, and particularly as they are constructed around differences of culture, race, nationality, religion and economic status. To reconcile is to bring into right relationship, to re-order our relationships and restore unity with God and one with another. This is not the task of politicians. This is your task and mine… Are we in a position to relate one to another as brothers and sisters? Are we ready to recognize the otherness of the other the way we wish them do so? Or do we continue to follow in the footsteps of Cain: 'Am I my brother's keeper?' 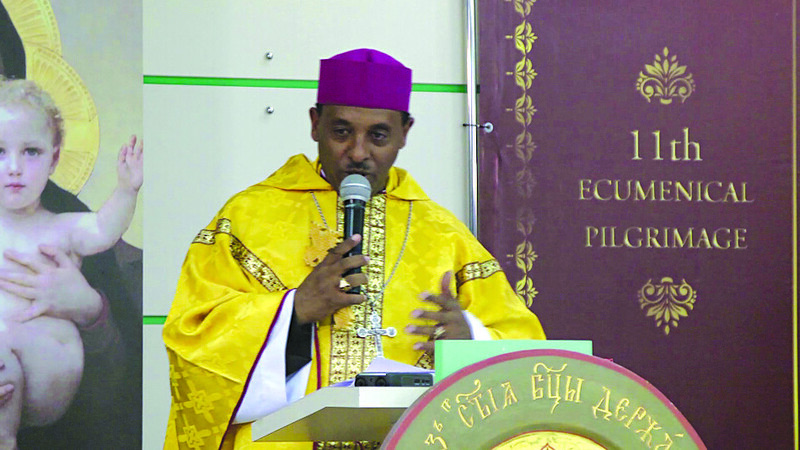 "
His Excellency Bishop Markos Gebremedhin from Ethiopia also spoke that evening. 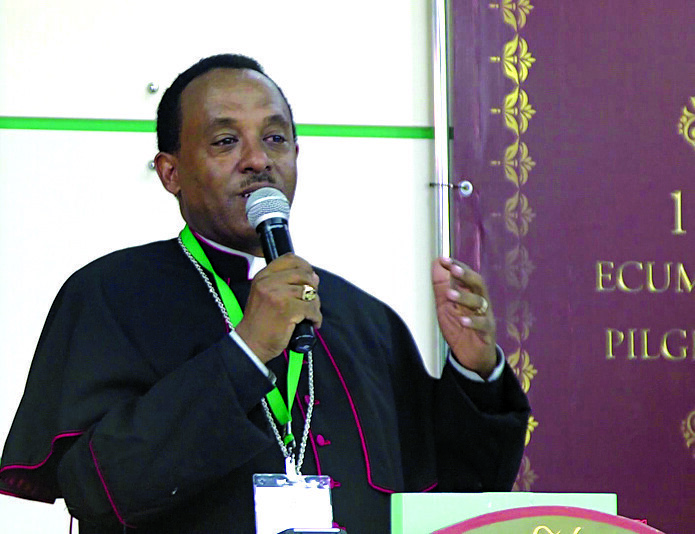 He is the Vicar Apostolic of Jimma- Bonga – Ethiopian Catholic Church, Bishop delegate for Peace and Justice desk in Ethiopia, and Bishop delegate for Religious issues in Ethiopia. "Wasn't it God’s plan for everybody to live peacefully? Didn’t Jesus pray for Peace and Unity of His disciples? Didn’t Jesus say 'when two or three gather together in My Name I will be in their midst?' Do we think Jesus agrees with our disagreement and disunity?" Then addressing every one of all religions, he asked: "Are we not brothers in God? Are we not created by Him? Are we not descendants of Abraham and one family of God? Are we not trying to reach in our own ways to Him, through faith, prayer and worship? Can’t we forget the past negative experiences and make sincere efforts to achieve mutual understanding for the better future of everybody? Can’t we Christians, Muslims, Buddhists and Jews together work to preserve and promote peace and justice and moral values? Don’t our Gospel and Qur'an speak often pardon and reconciliation?" 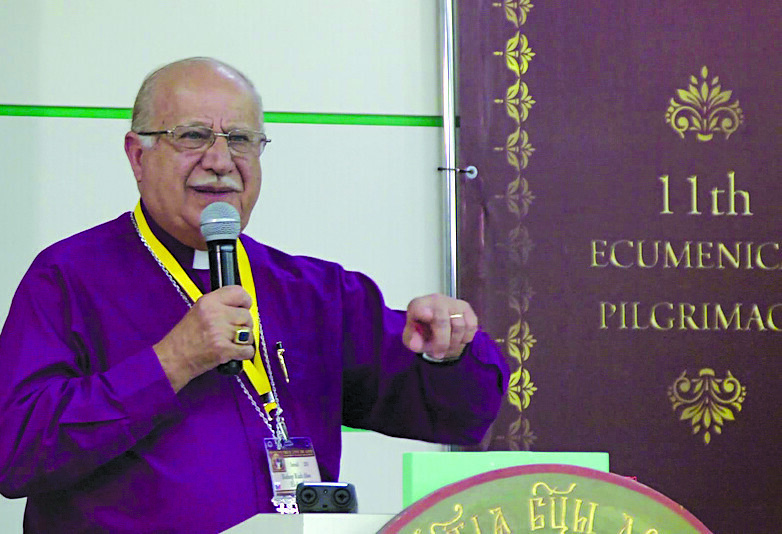 He spoke about the ecumenical and interfaith experiences in his country and ended by saying: "Serving God requires convictions and self-sacrifice." As usual, before the morning speeches we started with the Russian National Hymn and the Our Father in Aramaic. He continued: "From our point of view as Druze, we see that the world with its diversity, colors and differences, is nothing but the various facets of One Truth. Our Holy Koran guarantees this diversity and difference: 'O mankind, indeed We have created you from male and female and made you peoples and tribes that you may know one another. Indeed, the most noble of you in the sight of Allah is the most righteous of you.' (Al-Hujurat: 13) In addition, we maintain that true faith and sincere adoration must be translated into a good treatment to others; that is why our Sheikhs and Scholars repeat a short saying: 'we can find out whether a person has good religion (or faith) from how good they treat others;' that simple saying carries the spirituality of our noble Prophet's saying: 'the Muslim is the one from whose tongue and hand the people are safe.' "
He ended by saying: "In order to reach salvation we need to wait for a Divine Mercy that is beyond the will of humans, or to start a new human approach that is unlike anything in the past." 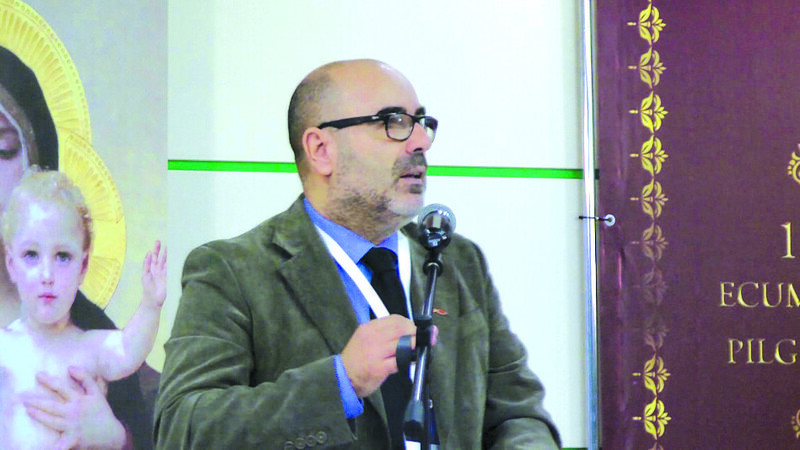 Then the enthusiastic Evangelical Pastor Mariano Arellano from the Spanish Evangelical Church in Spain took the podium. Pastor Mariano helped us meditate with him on the passage in the Gospel of Mark 9:33-35, when the apostles were arguing about who is the greatest and who is the most important. The pastor said: "When in our heart we ask that kind of question, we are admitting that some are better than others; that the truth we possess about God is more authentic than that of my brother who does not think or believe exactly as I do... When we fall into this dangerous dynamic we are trying to possess God, conform it according to our mental or ecclesiological structures ... And the truth is that none of us can take possession of God, no one can think that he possesses the monopoly of His truth, the monopoly of His Person or His love. . . . I believe that all Christian churches have sometimes fallen into this sin, and we must ask the Lord for forgiveness. And we must ask God together that He will teach us more about the nature of His Kingdom, that which Jesus approached in this world, in which there is no place for competition and rivalry, one in which there are no categories or barriers between its citizens, that in which no one pretends to take possession of God, but is God who takes over us, the kingdom that rests on His mercy, justice and love." Archbishop Selwanos spoke about the fact that countries today are using religion to achieve their goals. Various wars and conflicts are under the pretext of religion, while religion is innocent. He continued: "It is no wonder that we have turned towards interfaith dialogue and have pinned our hopes on reaching a successful solution that puts an end to these tragedies; and the truth is, as the well-known German Catholic theologian Hans Kung said: "There will be no peace among the nations without peace among the religions. There will be no peace among the religions without dialogue among the religions." Archbishop Selwanos quoted many verses from the Bible on peace and how Christians are called to make peace with everyone and that peace is a divine gift given by our Lord Jesus Christ before His Ascension. He added: "Peace is finally, as Saint Augustine said, serenity of mind, tranquility of soul, simplicity of heart, a bond of love, a companion of charity; it is the one that removes hostilities, stops wars, represses anger and breaks pride. It loves the rivals, reconciles the enemies and it is delightful and accepted by everyone." After a coffee break, we all came back to the conference hall for the Maronite Mass. The four Bishops from the Syriac tradition: Maronite and Syriac Catholic, concelebrated together. 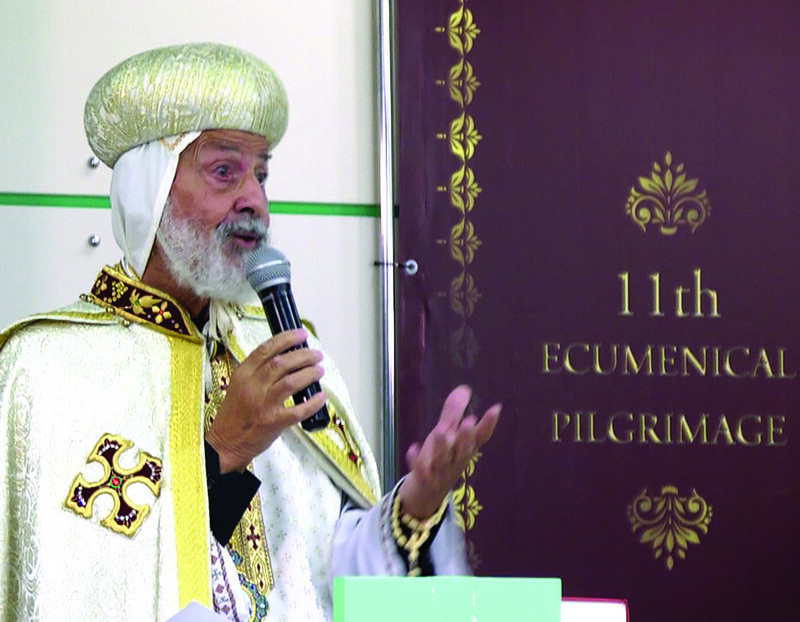 The Gospel was read by the bishop from the Syriac Orthodox Church. Fr. Nabil Mouanes delivered the homily focusing on the Holy Spirit as the One who will lead us into Unity and Reconciliation. In the afternoon, we all headed to visit Moscow's Cathedral Mosque--a beautiful and majestic structure that on its opening was inaugurated by President Vladimir Putin. We were able to visit the mosque during prayer time. It was a great opportunity to those who had never been inside a mosque or had never seen Muslim prayer live. It is good to mention here that during our visits we tried to interview our VIP guests asking them to give their opinion about the TLIG interfaith program. From the mosque we went straight to the Moscow Jewish Community Center for the interfaith meeting. It was a first during a TLIG pilgrimage. Many male pilgrims took kippas that were provided at the entrance to the synagogue and placed them on their heads out of respect for the rabbis and Jewish brothers. 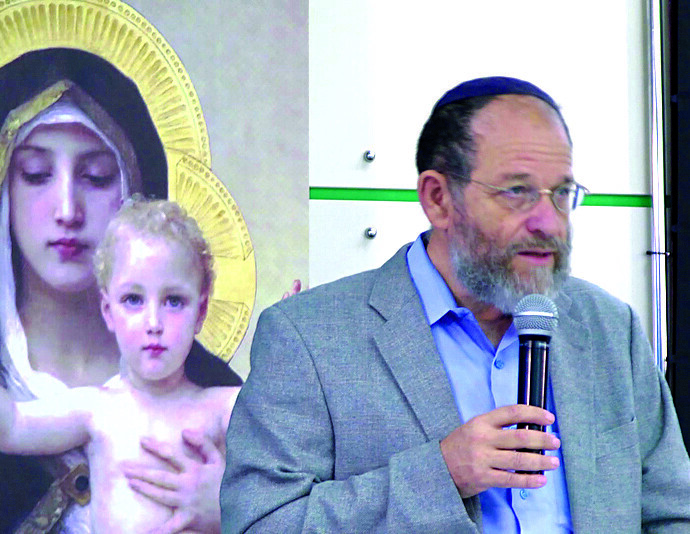 The panel consisted of several speakers: Chief Rabbi Berel Lazar, Rev. Dimitry Safonov, Islam Valitov, Rabbi Dr. Alon Goshen-Gottstein, Mr. Camel Bechikh, Ven. Michel Tao Chan, and of course, Vassula. Rabbi Alon opened the meeting by thanking Rabbi Lazar for their hospitality. He also said that the Mufti could not be with us but he supports our mission. Then, he started by asking Rabbi Lazar about what we could learn from his testimony on friendship. 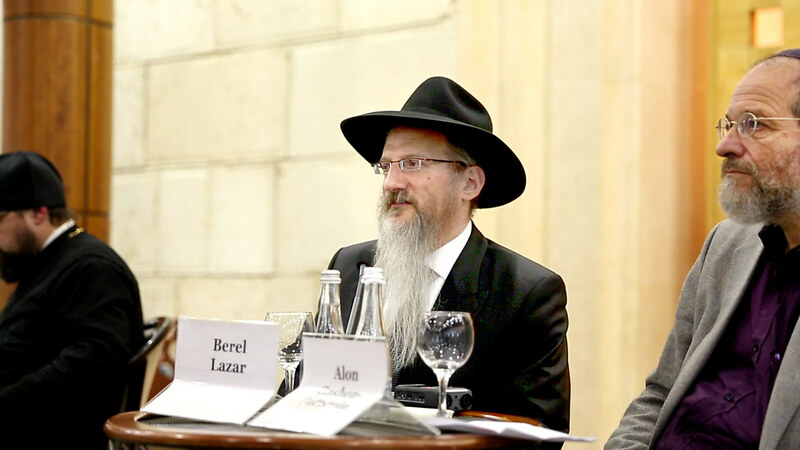 After welcoming us, Rabbi Lazar, who moved from Italy to Russia 30 years ago, during the time when religion was not allowed, said that religious people used to hide underground or in some forests outside Moscow to try and find out about their religion. He found out that not only Jews were suffering, but people of every other religion also. After Communism, the different religious leaders realized that only together can we open up to society and send a positive message to the people. He said that thanks to the Russian Orthodox Church they now have working relationships between the religions. They feel like brothers. 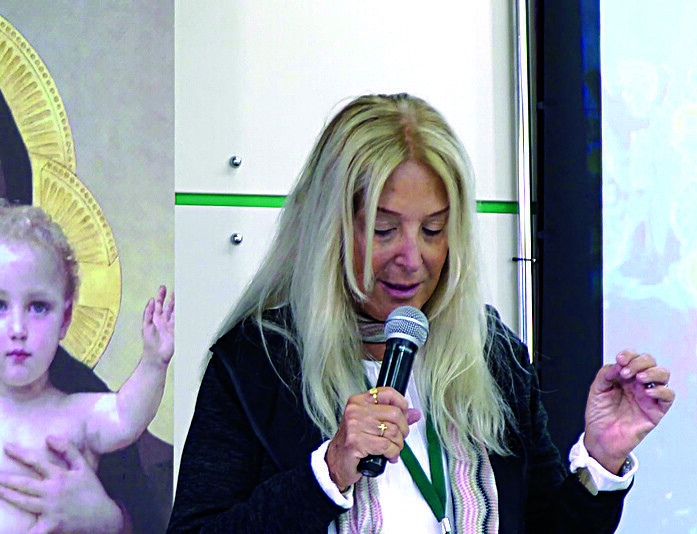 They have worked together on many projects, but the most important message is that there cannot be a religion that doesn't respect the other religions, that if you are a believer in God, you have to be able to open your heart to others and understand that there are different ways to reach God and different possibilities to embrace God. He continued by saying that people in Russia see that different religious leaders not only sit together, but decide ideas together and actually bring out new ideas in a united effort. He told us that once in a meeting with the Patriarch, His Holiness said that there would never be a vote in their meetings. If the decision was not unanimous, they would not move forward with that idea and until they are all together ready to move on, they won't do it. He ended his talk with an example of how Muslims and Jews live together and help each other in Russia. The second speaker was the Rev. Dimitry Safonov, representing Metroplitan Hilarion. Rev. Safonov is the Secretary for Interreligious Relations at the Department for External Church Relations. Rev. 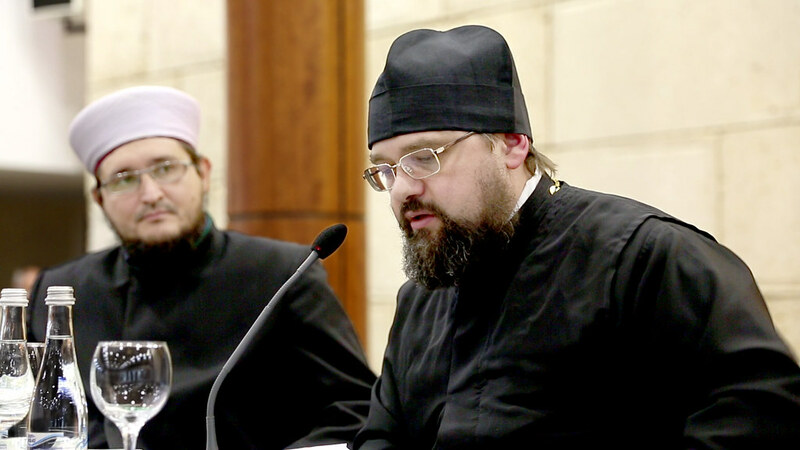 Safonov spoke about the experience of the Russian Orthodox Church in the interfaith dialogue which is conducted on the basis of the Interreligious Council of Russia. The primary tasks of the Council are peacemaking, assertion of moral values in society as well as practical work to improve the situation of religious communities in the legislative, economic and social spheres. According to him, practice has shown that the closeness of the moral values makes it possible for the traditional religions in Russia to engage in constructive cooperation and to come out as a united front with a consolidated position on a number of the socially significant issues. Regarding extremism, the presidium of the council pointed to the special importance that the raising of the level of religious literacy has, for the struggle with extremism to be effective, expressed readiness to make a joint effort to respond to the challenge. Summing up, he said, differences in religious beliefs are not reason for antagonism or enmity. On the contrary, for truly believing people it's natural to be in relations of friendship, mutual respect and accord to cooperate in the social sphere in many areas that promote peace and certain traditional moral values in society. 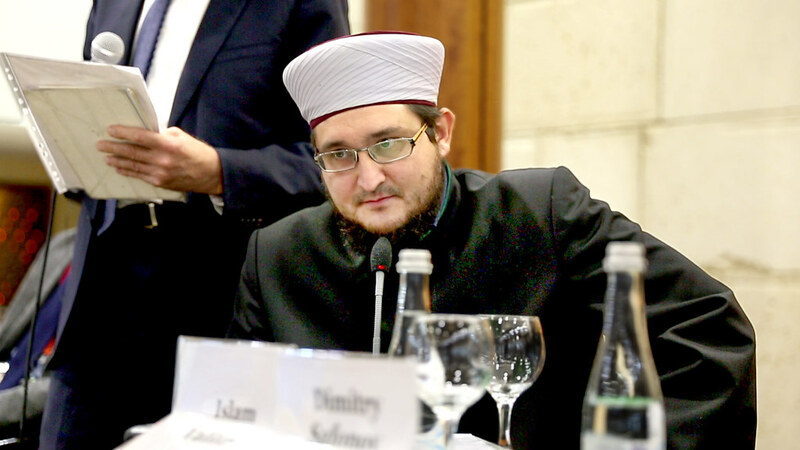 Next, was the representative of the Mufti, Islam Valitov. It was interesting to see that while Islam Valitov spoke in Russian, his translator into English was a Jewish Rabbi. 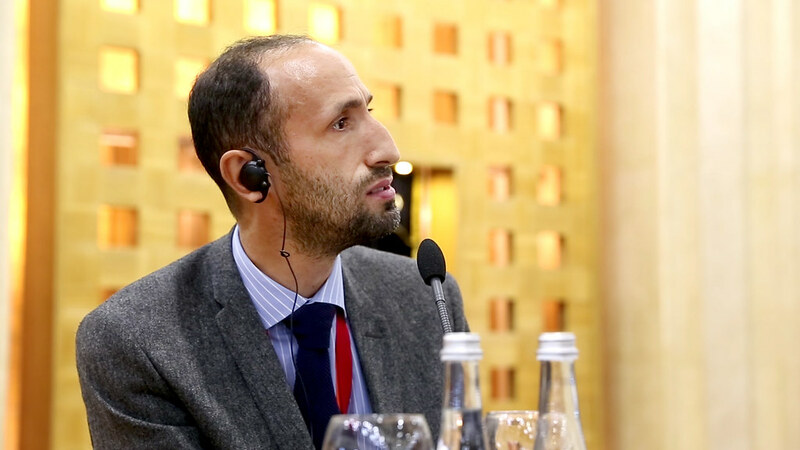 Islam said that the improvement of the interfaith dialogue, and the search for unity and mutual understanding between traditional religions play an important role in modern society. Today, we observe an increase of religious tolerance, mutual respect and understanding as well as cooperation of the religions. The level of improvement of this process is increasing from year to year as well. Speaking about the Russian experience, he noted that the "progress in this area will not only improve the existing bonds, but will also provide a certain momentum for the prevention of the religious extremism ideology." 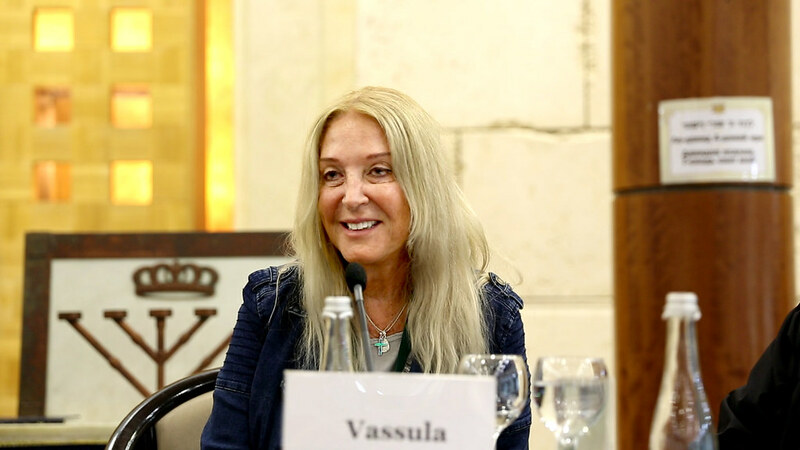 For her part, Vassula said that this was the first time in all the 11 pilgrimages TLIG has been doing, that we have been invited into a Jewish Center. We need prayer, dialogue and action to go forward. This time we opened more and that was an inspiration from God because God leads us into this. So we have heard the calling of God to go forward and open more to other religions to get them together with us. We have with us Muslims, Jews and Buddhists. All this was done with sincere love otherwise we can't go forward. 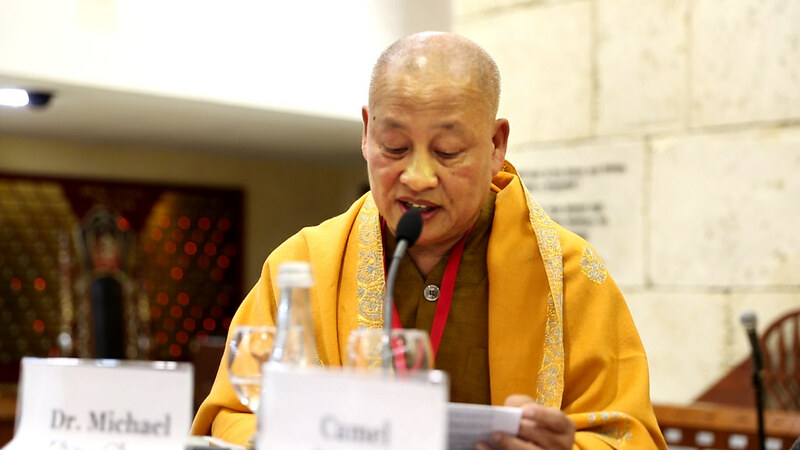 Then Venerable Dr. Michel Thao Chan, President & Founder “Cercle de Reflexion des Nations” (CRN) and Sino-European Development Formation & Culture (SED-FC) said, "My belief is that only what is beyond us brings us together. Is it the existence of God, his manifestation, his word, his strength and our opening of the heart in relation to all these?...Yes I trust. And today, it is our sincere smile and joy which is the expression of what surpasses us that brings us together." He told us a story about how the love of Thomas Edison's mother turned him into a genius. In response to a question, the Venerable spoke about awareness: to be aware of the value of the person in front of me, of the presence of God in that person. Mr. Camel Bechikh, Spokesman of Fils de France, and Founding member of La Manif pour Tous Bordeaux spoke about how his country France, has changed dramatically due to the fact that the religions in France have not been sufficiently united to limit these evolutions that go against their moral teachings. He said that beyond our differences there is a set of values that unite us, provided we are aware of the new context of globalization that is destroying us. He continued by saying that: "the one who divides, the one who separates Man from God, who separates husband and wife, parents and children... we call him the devil, diabolo 'the one who divides,' Shaytan’ in Arabic has the same root which means division, separation... On the contrary, there is the angel who has the desire for union for Good." After the talks, the wife of Rabbi Alon shared with us a beautiful story of friendship with a Palestinian woman. Also, an Orthodox priest, who was with us, shared with us how he was reluctant to enter the mosque as well as the synagogue, but then he decided to go because he trusted Vassula's discernment and that she is guided by the Lord and he was, therefore, so grateful for those experiences. We saw that something inside him healed. It seems that those visits on that day have opened the hearts of many Christian pilgrims touching them deeply and made them realize that those who do not share our faith are still the children of God and loved in the same way. 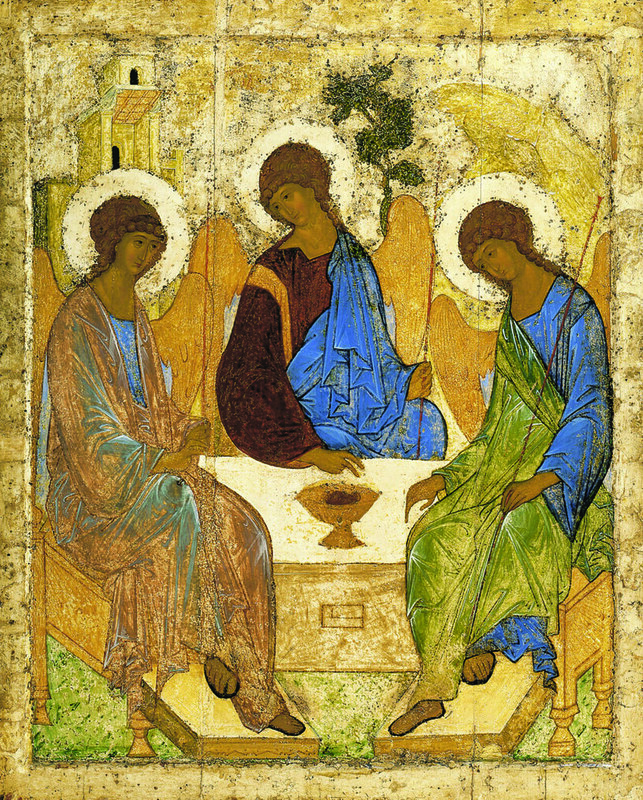 On this day we had free time in the morning after which those who had not visited Red Square went there and they also visited the Tretyakov Gallery where they saw the original Trinity of Rublev as well as the original icon of Our Lady of Vladimir displayed inside a church connected to the Gallery. 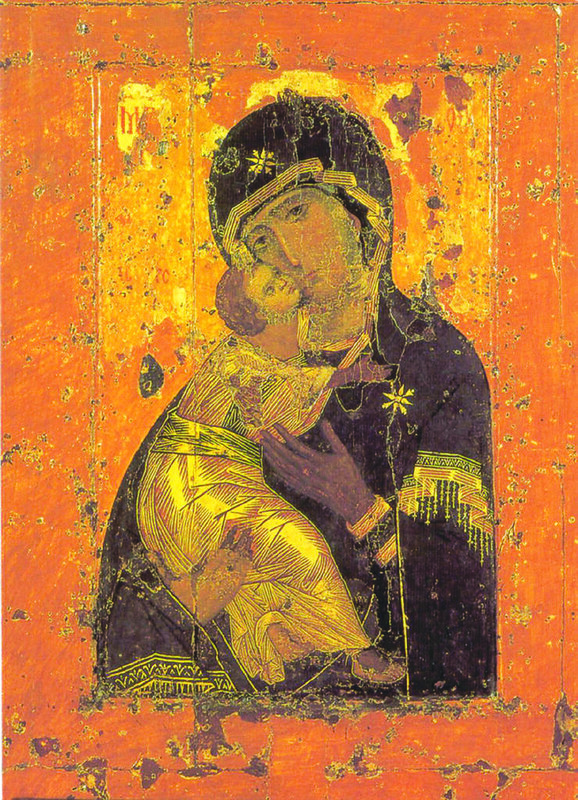 We recognize the icon from the turned left foot of Jesus. In the evening we had a Melkite Liturgy and a healing prayer ceremony. Clergymen from the various denominations as well as Vassula prayed over the pilgrims for healing. 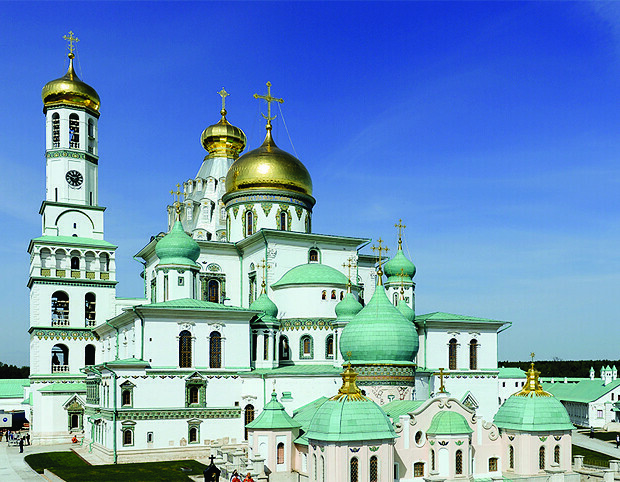 The most amazing place was left for us to see on this day: The New Jerusalem Monastery. It is a replica of the Church of the Resurrection in Jerusalem and inside it there is also a replica of the Holy Sepulchre. The pilgrims lined up to go inside it--mainly those who have never been to Jerusalem. The atmosphere in that cathedral is that of reverence and awe. The icons from the Old Testament decorate the inside of the cupola with vivid heavenly colors. One would want to scream: Glory to God in the Highest! Thank God they were able to restore it to the glorious state it is today. Vassula telling the Muslim Sheikhs that one of her ancestors was the first person to translate the Koran to the Greek language and that she still has a copy of that old version. "Let us learn from the Prophets of old,” she said, “how on their way they learned self-renunciation and self-denial by putting God’s Interests and God Himself first in their life. They learned to strip themselves from their ego, and their will. . . . I will end up by giving you a small example of a tree: All the branches of a tree are holy if the root is holy. No doubt some of the branches have been cut off, and, like shoots of wild olive, you have been grafted among the rest to share with them the rich sap provided by the olive tree itself, but still, even if you think yourself superior to the other branches, remember that you do not support the root; it is the root that supports you. And the root is God. Therefore, all of us have not only an important role to play in maintaining peace and unity but an obligation. I sincerely hope that the day will come that through our efforts we will achieve the peace that all of us are aiming at and that God expects from us and that we can say sincerely one day to one another: 'my brother, my sister.' 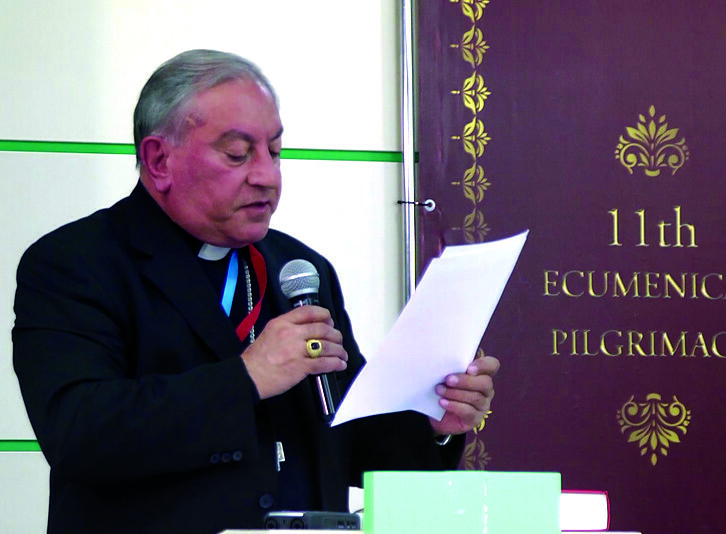 "
After her talk, Cardinal Toppo delivered his speech. He reminded us of the words of Pope Francis on World Peace Day 2014, when he said: "Fraternity is an essential human quality, for we are relational beings. A lively awareness of our relatedness helps us to look upon and to treat each person as a true sister or brother; without fraternity it is impossible to build a just society and a solid lasting peace." He ended by saying: "I am extremely happy that we have gathered from different faiths as brothers and sisters bound together by the same love of God. In Him we are one and in Him we will remain is the message manifested in and through this august gathering. I pray that our togetherness and the open reflections will make us the real instruments of peace to this world torn apart for various reasons. Peace is a gift as well as a task and responsibility. Peace is not a tranquilizer but the greatest energizer to be always alive, vibrant and passionate to the cause of peace. We are the sons and daughters of God and therefore we are implicitly the peacemakers. Once again, welcome to all of you and let us be vibrant peacemakers." Then we had a Roman Catholic Mass to celebrate the end of a very blessed and fruitful pilgrimage. At the end of the pilgrimage, Vassula and the organizing team received several words of appreciation from various VIPs. (Please see page 79 of the TLIG Magazine, Issue #39).